Announcement: From now until the end of the month broadcasts will be intermittent. An original bite-sized closet drama in 5 acts by Richard Mc Sweeney aka Richard of Éire – a self-designated lyrical Planet Earth philosopher of the natural kind. Act 1. Anecdote & the Sage in the Digital Age. Act 2. A reading from William Shakespeare’s As You Like It. Act 3. A reading from Lao-tzu’s Tao Te Ching. Act 4. An interpretation after my own fashioning of some lines from the philosophical Taoist work: The Book of Chuang-tzu. Act 5. Foretelling. Google Podcasts seamlessly syncs “eTiding125 – 14August2018” across a variety of Google products, including the Google Assistant, thus making Radio Richard Ireland easier than ever to be known and enjoyed on Earth and in the Cosmos. Announcement: From now until the end of the month broadcasts will be intermittent. An original bite-sized closet drama in 5 acts by Richard Mc Sweeney aka Richard of Éire – a self-designated lyrical Planet Earth philosopher of the natural kind. Act 1. Anecdote & the Sage in the Digital Age. Act 2. A reading from William Shakespeare’s As You Like It. Act 3. A reading from Lao-tzu’s Tao Te Ching. Act 4. An interpretation after my own fashioning of some lines from the philosophical Taoist work: The Book of Chuang-tzu. Act 5. Foretelling. Google Podcasts seamlessly syncs “eTiding124 – 3August2018” across a variety of Google products, including the Google Assistant, thus making Radio Richard Ireland easier than ever to be known and enjoyed on Earth and in the Cosmos. Announcement: From now until the end of August 2018 broadcasts will be intermittent. An original bite-sized closet drama in 5 acts by Richard Mc Sweeney aka Richard of Éire – a self-designated lyrical Planet Earth philosopher of the natural kind. Act 1. Anecdote & the Sage in the Digital Age. Act 2. A reading from William Shakespeare’s As You Like It. Act 3. A reading from Lao-tzu’s Tao Te Ching. Act 4. An interpretation after my own fashioning of some lines from the philosophical Taoist work: The Book of Chuang-tzu. Act 5. Foretelling. Google Podcasts seamlessly syncs “eTiding123 – 27July2018” across a variety of Google products, including the Google Assistant, thus making Radio Richard Ireland easier than ever to be known and enjoyed on Earth and in the Cosmos. Announcement: From now until the end of August 2018 broadcasts will be intermittent. An original bite-sized closet drama in 5 acts by Richard Mc Sweeney aka Richard of Éire – a self-designated lyrical Planet Earth philosopher of the natural kind. Act 1. Anecdote & the Sage in the Digital Age. Act 2. A reading from William Shakespeare’s As You Like It. Act 3. A reading from Lao-tzu’s Tao Te Ching. Act 4. An interpretation after my own fashioning of some lines from the philosophical Taoist work: The Book of Chuang-tzu. Act 5. Foretelling. Google Podcasts seamlessly syncs “eTiding122 – 24July2018” across a variety of Google products, including the Google Assistant, thus making Radio Richard Ireland easier than ever to be known and enjoyed on Earth and in the Cosmos. Announcement: From now until the end of August 2018 broadcasts will be intermittent. An original bite-sized closet drama in 5 acts by Richard Mc Sweeney aka Richard of Éire – a self-designated lyrical Planet Earth philosopher of the natural kind. Act 1. Anecdote & the Sage in the Digital Age. Act 2. A reading from William Shakespeare’s As You Like It. Act 3. A reading from Lao-tzu’s Tao Te Ching. Act 4. An interpretation after my own fashioning of some lines from the philosophical Taoist work: The Book of Chuang-tzu. Act 5. Foretelling. Google Podcasts seamlessly syncs “eTiding121 – 19July2018” across a variety of Google products, including the Google Assistant, thus making Radio Richard Ireland easier than ever to be known and enjoyed on Earth and in the Cosmos. Announcement: From now until the end of August 2018 broadcasts will be intermittent. An original bite-sized closet drama in 5 acts by Richard Mc Sweeney aka Richard of Éire – a self-designated lyrical Planet Earth philosopher of the natural kind. Act 1. Anecdote & the Sage in the Digital Age. Act 2. A reading from William Shakespeare’s As You Like It. Act 3. A reading from Lao-tzu’s Tao Te Ching. Act 4. An interpretation after my own fashioning of some lines from the philosophical Taoist work: The Book of Chuang-tzu. Act 5. Foretelling. Google Podcasts seamlessly syncs “eTiding120 – 12July2018” across a variety of Google products, including the Google Assistant, thus making Radio Richard Ireland easier than ever to be known and enjoyed on Earth and in the Cosmos. Announcement: From now until the end of August 2018 broadcasts will be intermittent. An original bite-sized closet drama in 5 acts by Richard Mc Sweeney aka Richard of Éire – a self-designated lyrical Irish philosopher of the natural kind. Act 1. Anecdote & the Sage in the Digital Age. Act 2. A reading from William Shakespeare’s As You Like It. Act 3. A reading from Lao-tzu’s Tao Te Ching. Act 4. An interpretation after my own fashioning of some lines from the philosophical Taoist work: The Book of Chuang-tzu. Act 5. Foretelling. Google Podcasts seamlessly syncs “eTiding119 – 2July2018” across a variety of Google products, including the Google Assistant, thus making Radio Richard Ireland easier than ever to be known and enjoyed on Earth and in the Cosmos. An original bite-sized closet drama in 5 acts by Richard Mc Sweeney aka Richard of Éire – a self-designated lyrical Irish philosopher of the natural kind. Act 1. Anecdote & the Sage in the Digital Age. Act 2. A reading from William Shakespeare’s As You Like It. Act 3. A reading from Lao-tzu’s Tao Te Ching. Act 4. An interpretation after my own fashioning of some lines from the philosophical Taoist work: The Book of Chuang-tzu. Act 5. Foretelling. Google Podcasts seamlessly syncs “eTiding118 – 29June2018” across a variety of Google products, including the Google Assistant, thus making Radio Richard Ireland easier than ever to be known and enjoyed on Earth and in the Cosmos. An original bite-sized closet drama in 5 acts by Richard Mc Sweeney aka Richard of Éire – a self-designated lyrical Irish philosopher of the natural kind. Act 1. Anecdote & the Sage in the Digital Age. Act 2. A reading from William Shakespeare’s As You Like It. Act 3. A reading from Lao-tzu’s Tao Te Ching. Act 4. An interpretation after my own fashioning of some lines from the philosophical Taoist work: The Book of Chuang-tzu. Act 5. Foretelling. Google Podcasts seamlessly syncs “eTiding117 – 28June2018” across a variety of Google products, including the Google Assistant, thus making Radio Richard Ireland easier than ever to be known and enjoyed on Earth and in the Cosmos. An original bite-sized closet drama in 5 acts by Richard Mc Sweeney aka Richard of Éire – a self-designated lyrical Irish philosopher of the natural kind. Act 1. Anecdote & the Sage in the Digital Age. Act 2. A reading from William Shakespeare’s As You Like It. Act 3. A reading from Lao-tzu’s Tao Te Ching. Act 4. An interpretation after my own fashioning of some lines from the philosophical Taoist work: The Book of Chuang-tzu. Act 5. Foretelling. Google Podcasts seamlessly syncs “eTiding116 – 27June2018” across a variety of Google products, including the Google Assistant, thus making Radio Richard Ireland easier than ever to be known and enjoyed on Earth and in the Cosmos. An original bite-sized closet drama in 5 acts by Richard Mc Sweeney aka Richard of Éire – a self-designated lyrical Irish philosopher of the natural kind. Act 1. Anecdote & the Sage in the Digital Age. Act 2. A reading from William Shakespeare’s As You Like It. Act 3. A reading from Lao-tzu’s Tao Te Ching. Act 4. An interpretation after my own fashioning of some lines from the philosophical Taoist work: The Book of Chuang-tzu. Act 5. Foretelling. Google Podcasts seamlessly syncs “eTiding115 – 26June2018” across a variety of Google products, including the Google Assistant, thus making Radio Richard Ireland easier than ever to be known and enjoyed on Earth and in the Cosmos. An original bite-sized closet drama in 5 acts by Richard Mc Sweeney aka Richard of Éire – a self-designated lyrical Irish philosopher of the natural kind. Act 1. Anecdote & the Sage in the Digital Age. Act 2. A reading from William Shakespeare’s As You Like It. Act 3. A reading from Lao-tzu’s Tao Te Ching. Act 4. An interpretation after my own fashioning of some lines from the philosophical Taoist work: The Book of Chuang-tzu. Act 5. Foretelling. Google Podcasts seamlessly syncs “eTiding114 – 25June2018” across a variety of Google products, including the Google Assistant, thus making Radio Richard Ireland easier than ever to be known and enjoyed on Earth and in the Cosmos. An original bite-sized closet drama in 5 acts by Richard Mc Sweeney aka Richard of Éire – a self-designated lyrical Irish philosopher of the natural kind. Act 1. Anecdote & the Sage in the Digital Age. Act 2. A reading from William Shakespeare’s As You Like It. Act 3. A reading from Lao-tzu’s Tao Te Ching. Act 4. An interpretation after my own fashioning of some lines from the philosophical Taoist work: The Book of Chuang-tzu. Act 5. Foretelling. Google Podcasts seamlessly syncs “eTiding113 – 22June2018” across a variety of Google products, including the Google Assistant, thus making Radio Richard Ireland easier than ever to be known and enjoyed on Earth and in the Cosmos. An original bite-sized closet drama in 5 acts by Richard Mc Sweeney aka Richard of Éire – a self-designated lyrical Irish philosopher of the natural kind. Act 1. Anecdote & the Sage in the Digital Age. Act 2. A reading from William Shakespeare’s As You Like It. Act 3. A reading from Lao-tzu’s Tao Te Ching. Act 4. An interpretation after my own fashioning of some lines from the philosophical Taoist work: The Book of Chuang-tzu. Act 5. Foretelling. 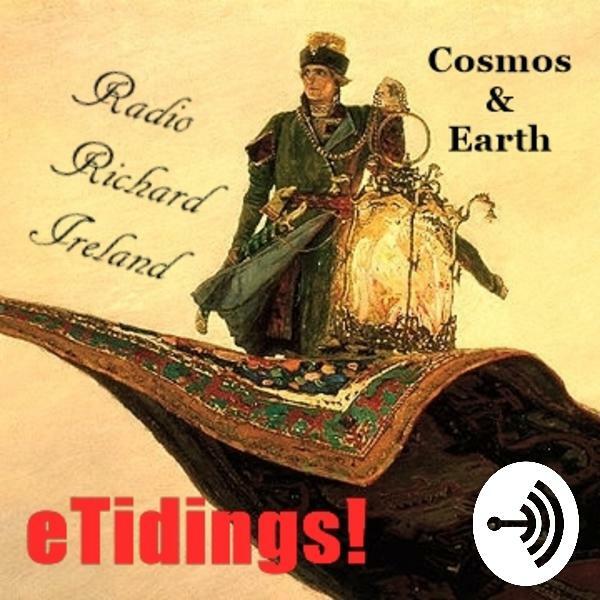 Listen up: Google Podcasts seamlessly syncs “eTiding112 – 21June2018” across a variety of Google products, including the Google Assistant, thus making Radio Richard Ireland easier than ever to be known and enjoyed on Earth and in the Cosmos.